We know it’s what you want for Christmas. Hot new procedures on your wish list! Put a twinkle in your eye with FABULOUS Eyebrows. Transform your look with Everlasting Brows from at SKIN the Spa at Runnels Center. Everlasting Brows are semi-permanent makeup that is completely realistic, waterproof and lasts up to 18 months. Through microblading, individual hairs are drawn precisely, yielding an exceptionally natural appearance in any color, event with no original hair. They will transform and frame your face! Leave the Double Chin to Santa! Ho,Ho, Ho! No need to hide your double chin when you can put an end to it with Kybella. Kybella is the only FDA-approved injectable that contours moderate to severe fat below the chin. Kybella is a naturally-occurring molecule that breaks down fat. Once your aesthetic goals are achieved, ongoing treatment is not expected. Have you been Walking in a Winter Wonderland? Does your skin need a little holiday pick-me-up? Try one of these AMAZING skin treatments. HydraFacial MD is the latest advance in non-laser skin resurfacing. Exfoliation, extraction and hydration in one quick, non-invasive treatment. Targets conditions such as fine lines, wrinkles, hyper pigmentation, brown spots, sun damage, acne-prone or oily skin and more. Immediate results with NO downtime! SkinPen 2 is a micro needling procedure that is a QUICK procedure and minimally invasive. With little downtime, this procedure is ideal for a busy lifestyle and before the holidays! It is safe for all skin-types, and helps reduce the appearance of fine lines and smooth wrinkles. Embrace the mistletoe and LOVE your lips again! You just might see mommy kissing Santa Claus after a Volbella treatment. New Volbella restores fullness, in just one treatment, with a gorgeous, smooth look that doesn’t appear unnatural or disproportionate through a subtle filler to reduce fine lines and wrinkles. Even naturally full lips benefit from enhanced lip shape. 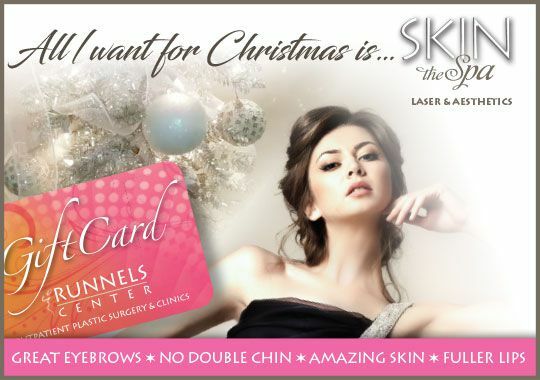 So, dash away all to SKIN the Spa at Runnels Center this Christmas! Call 601.939.2457 to book your appointment today!